Deadline to send in materials for the February issue is December 13! When will I get the December issue? The December issue is currently printing and mailing. Most churches’ HTH should arrive between December 15 and January 15. Dated materials will be given priority. What events go in the February issue? Any event dated between February 5 and April 15 should go in the February issue. FREE BOOK: If someone is converted through HTH, we will send a free book for you to present to him or her. Please e-mail us at hth@housetohouse.com to request this free material. GOOD NEWS BACK FROM THE FIELD! 544 Studies! We have received 37 requests for Bible studies connected to the last issue of HTH, bringing the year-to-date studies to 544. Conversion in Michie, Tennessee: Matt Wallin says, "I had a great conversation at the Freed-Hardeman lectures that I want to share with you. A couple in their 50s walked up to me at the House to House booth. They were smiling really big. Tim introduced himself and his wife Trudi. He told me that House to House was the first exposure they ever had to the church of Christ. About two years ago, they moved to rural Tennessee and bought some land. While they were clearing it and getting it ready to live on, they lived in an RV. They didn't have a mail box, of course, so they decided to get a P. O. Box. In their box they got a copy of House to House. They immediately loved it, and they were impressed with it's look and the content of the articles. A few days later Tim was hired to do some handyman work. Tim had been wondering where they should go to church, and he asked the man, 'Where do you go to church?' This brother replied to Tim, 'I'm a member of the church of Christ.' Tim thought, 'Wow! Two touches from the church of Christ lately. We've got to go check them out.' And they did. They studied with the local church and were converted. Trudi told me that they took every back issue of House to House and all the tracts that the church had and poured through them. Since their conversion they have been sharing those copies with their denominational family in hopes of bringing them to the one true church." Conversion in Tazewell, Virginia: Conway Hutton from the Tazewell church of Christ in Virginia called. He said that one of their eight members is a woman who was converted through House to House. She was raised in the Church of God and then attended a Methodist Church after marriage. Her Methodist congregation was closing, and she was looking for a new congregation when she got a copy of House to House from them. She got the House to House in June, studied with Conway, and was converted. She is faithful in attendance now and asks lots of good questions at every Bible study and is growing daily. HTH Used in Prison Ministry in Van, Texas: James Haynes from the church in Van, Texas, wrote us to say, "We have about 35–40 in our inmate program. We send them a lot of your material, including old H2H we have here. Some inmates complete the quiz and request tracts. Take joy in knowing that so much of your work is helping us in this prison ministry. We have had one baptism, and who knows how many more are drawing near to God." Visitors in Cleburne, Texas: Kevin Rhodes is the new director for the Brown Trail School of Preaching in Bedford, Texas, and the minister for the Granbury Street church of Christ in Cleburne, Texas. Brother Rhodes says, "We had another couple from the community visit just this morning as a direct result of House to House. We have had more drop-in visitors (with one couple returning regularly) since sending House to House to the whole of Cleburne than in all our other efforts combined for more than a decade. Thank you for making that possible!" Rwanda: We sent 500 copies of the July issue of House to House to our contact in Gahini, Rwanda. He has also received some information from WVBS and has several people in his area reading through the Bible. After studying the Bible with several contacts, they baptized three young men for the remission of their sins. Benin: There is a brotherhood work in Benin, Africa (French- speaking Africa) that is handing out copies of House to House/Heart to Heart in French, along with French copies of the Bible. They are literally putting the Bible into the hands of people that have never even seen one, much less owned one. Here is one the great pictures they shared with us. The Isle of Man: We got another encouraging email from an international work that got the July issue of House to House. This picture comes from the Isle of Man. The Isle of Man is a self-governing British Crown dependency in the Irish Sea between England and Ireland. This is the first church of Christ on the island as far as recorded history can tell. Nigel Wright emailed me to say, "Brother Matt, thank you so much for the magazines. They arrived today and are beautiful. We will get to work on distributing them to the Island. "Thanks for the encouragement! My wife and I are definitely in a mission field! The island has no recorded history of having a church of Christ in its long history. I had initially contacted Keith Sisman (traces-of-the-kingdom.org) before he passed on. He had done tremendous research on churches of Christ in Britain, dating back to the thirteenth century. Nothing came up on the Isle of Man. This was one of the key reasons we decided to step out in faith and go there." We get excited about reaching so many homes in our country (and rightfully so), but what if the greatest thing we ever do is help one person in a foreign country? 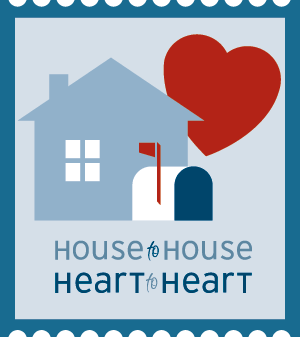 If you would like to sign up for 12 issues and begin contacting your community every month, please let us know at Signup.housetohouse.com or by calling 877-338-3397. February | Are You Covered? July | What Does “Believe on the Lord Jesus Christ, and You Will Be Saved” Mean? August | Has Man Outgrown the Gospel? September | I Quit Church After a Bad Experience, Why Should I Go Back? I want to submit an event or article. How do I do that, and what is the deadline?